"Hydrogeology"; 14"x14"x0.75" acrylic on stretched canvas with a matte varnish. The original canvas painting by Charles Morgan, 2019. Charles Morgan, aged 44, originally from Minnesota has been based in Phoenix, Arizona, since 1997. For more than 17 years, Charles was a business executive in the technology industry specializing in information systems. Charles has always been a curious musician and multi-instrumentalist who can play piano, guitar, bass, and drums. 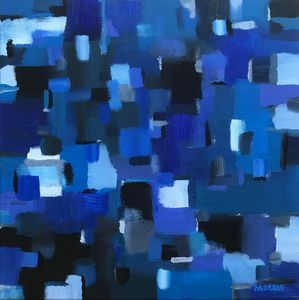 He grew up with music and learned instruments at a young age, but he only began exploring canvas painting very late in life and created his first painting in the spring of 2018. 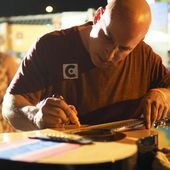 Charles started his artistic venture, Soapbox Creative, soon after so he could pursue his lifelong passion for creating artwork based on original ideas, inspirations and personal experiences. He is also a published writer of modern poetry and his first publication titled "Soapbox Scorpio" can be found online. He enjoys sharing artistic philosophies and performing music with friends. Charles' artwork can be found on exhibit from time to time and also online.